David and I cannot thank you enough for making our dream wedding come true. 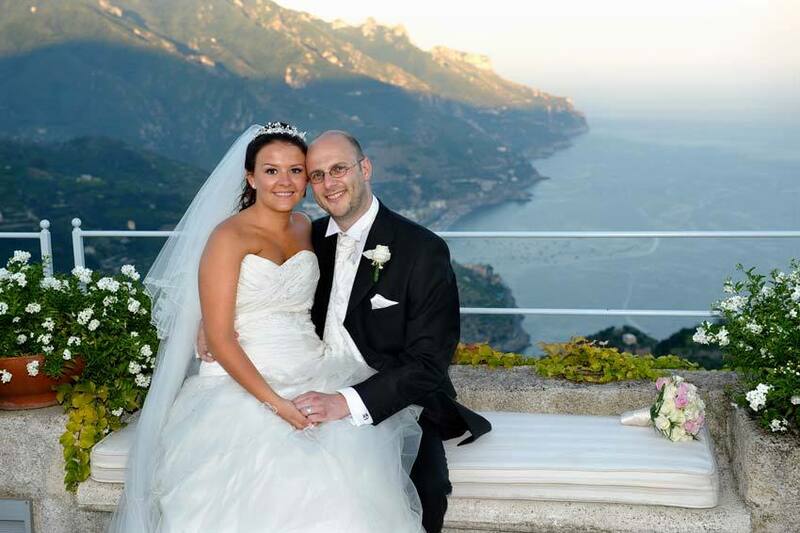 When we first decided we were to get married in Ravello the thought was a little daunting, worrying about how we were to get everything sorted, paperwork, town hall, and then most importantly flowers :-) but as soon as we were recommended you and your company we never had to worry about anything as it was in your very capable hands. We still can't believe how trouble free making the arrangements with you were. It was especially great that i could always get in contact with you, even with the smallest little questions! Our ceremony was perfect, not too long, i know some of our guests were worried about getting to hot but it was nicely shaded. I also have to give thanks to Anna here as she was very good at keeping David calm when he was waiting for me to arrive, and also making the day run smoothly in general. All those involved in the day were of the best standard, the photographer, videographer and all of the musicians did a fantastic job, we are especially pleased with our photos and i will attach a couple of our favourites. Thank you so much to you Laura and everyone at Exclusive Italy for all your hard work, we could not recommend you enough! You made our day so special and i know our guests, even the ones that may not choose Ravello for their usual summer holiday had the most wonderful time! !